The Cumulative Distribution Function (CDF) of a continuous random variable, x, is equal to the integral of its probability density function (PDF) to the left of x. This value represents the area below the PDF to the left of the point of interest, x.
Y-axis: represents the probability of "x" or lower occurring. The range is 0-1 with 1 representing 100% of the values of "x". A y-value of 0.5 is at the mean "x" value. 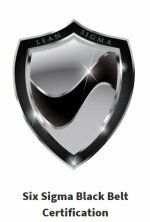 If the PDF of a continuous random variable is known to be 0.08x where x is valid from 0 to 5. Find the probability (cumulative distribution function) of x being less or equal to 2.3. 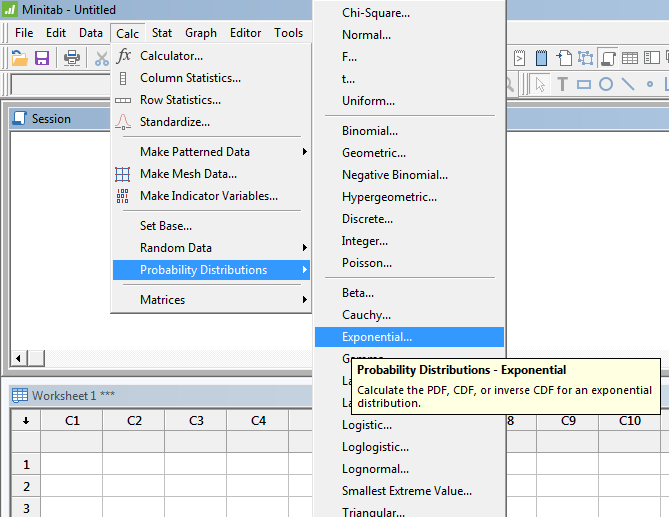 The function NORM.DIST (former Excel version used NORMDIST) calculates the Normal Probability Density Function or the Cumulative Normal Distribution Function. FALSE for the Normal Probability Density Function. The inverse cumulative distribution function is used to estimate "x" where a certain percent of probability has occurred. 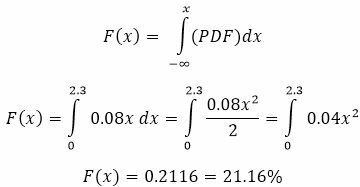 You can find the PDF, CDF, and Inverse CDF for several types of distributions. Shown below is a snapshot of the menus.